Kenyans are really innovative when it comes to entrepreneurship. There has been stiff competition in the transport industry that has seen many matatu owners mainly in the CBD doing all sorts of renovation in order to attract customers to their vehicles. This is mostly common with short distance matatus i.e Rongai route and embassava. 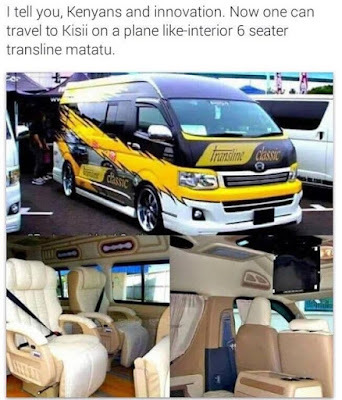 Well it is on rare occasions where you find long distance Nissan matatu’s designed with special features to attract the attention of travelers. Well the owner of a transline Nissan plying the Kisii route has left many talking after he modified his vehicle to a six seater van but the design actually looks like that of a plane.